Chicken is delicious, but let’s be honest: it can take a while to prep, shop for, and cook. After a long day at work, the last thing you want is to labor over the stove for an hour. But what if all you needed for your favorite recipes was delivered right to your door, and dinner be ready in a matter of minutes? If you’re a chicken lover, then HelloFresh is perfect for you. 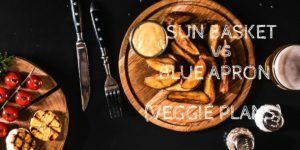 Each week there are 10 new recipes to the menu, with about 4 of them being chicken meals — so you never get bored of the same dish. The chicken dishes from HelloFresh are creative, easy to make, and absolutely delicious. With such a wide variety of meals to choose from, you’ll never get bored with the options. These 5 chicken dishes are absolute must-tries from their menu selection. If you’re wondering just how good the chicken menu from HelloFresh can be, then look no further. The Chicken Pineapple Quesadillas from HelloFresh is the favorite of many from the menu. Paired perfectly with pineapple and seasoned with a delicious southwest spice blend, the combination of sweet and spicy makes this Mexican dish a must-try. Inside the quesadillas are chicken and vegetables. The incredibly tender chicken is the main feature of the dish, and the farm-fresh vegetables accompany it perfectly. 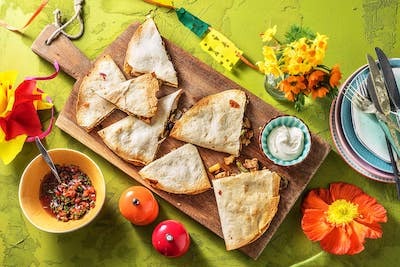 Plus, the Chicken Pineapple Quesadillas are one of the easiest dishes to make from HelloFresh, and only takes 27 minutes to cook. 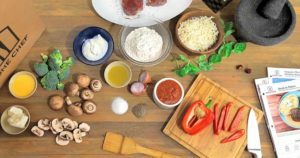 The Chicken Sausage Pizzas are loved by many HelloFresh customers and make a marvelous Italian addition to the menu. 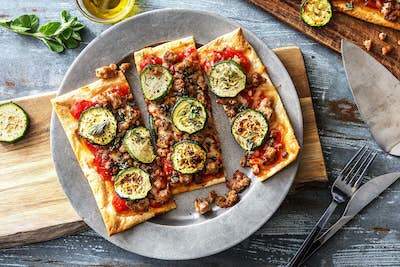 Topped with sausage, zucchini, and chicken, the pizza is a delicious and healthy option. Not only is the pizza extremely tasty, but it’s also easy to make and requires little prep time. Like the Chicken Pineapple Quesadillas, the Chicken Sausage Pizzas only takes 27 minutes to make. Like many other HelloFresh meals, you’re guaranteed to have leftovers, as the portions are very generous. 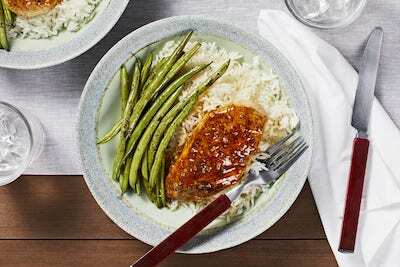 Imagine enjoying a huge bite of seared chicken coated in a ginger and apricot jam sauce, along with the crisp and fresh taste of green beans and buttered rice. 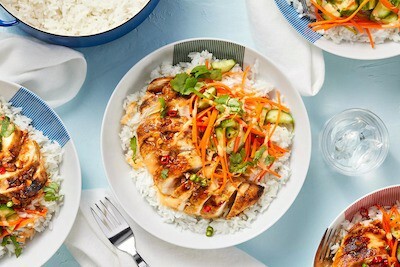 The Apricot Ginger Chicken recipe from HelloFresh is another common favorite, and it’s easy to see why. Cooking it only takes about 15-20 minutes, making it easy to put together and throw on a plate. Accompanying the main chicken entree is green beans and buttery rice, both healthy and delicious side dishes. The fact that this meal is considered “calorie smart” by HelloFresh makes it even better. 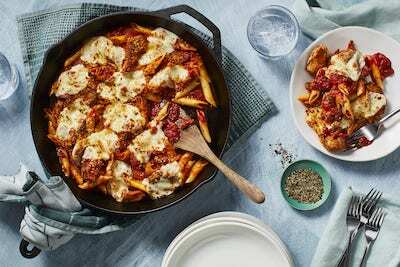 The Melty Mozzarella Chicken Pomodoro Bake dish is the perfect warm dish for any lunch or dinner, and is guaranteed to melt your heart. The chicken is spiced with Tuscan and accompanied by bites of al dente penne coated in tomato sauce. Bread crumbs and melted mozzarella cheese finish the dish and make it ready for broiling. Voila, you have a delicious, heartwarming chicken meal that takes little preparation and is ready to enjoy within minutes. This mix of savory and spicy Vietnamese cuisine features chicken, rice, and fresh vegetables that leave you feeling full but not heavy. To give the meat a special flavor, it is topped off with a sauce that’s both sweet and spicy, along with lime and sriracha. 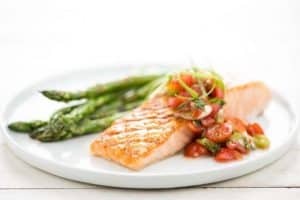 Cooking healthy and delicious meals shouldn’t be stressful, exhausting, or time-consuming. With HelloFresh, you still get to experience cooking nutritious meals that don’t taste like the frozen alternatives you get from the grocery store. If you’re a chicken lover, then we’re confident HelloFresh is for you.